As we head into holiday season, the Normal Theater is pulling out the classics. Later in November, they'll offer Holiday Inn, The Bishop's Wife, Meet Me in St. Louis and The Shop Around the Corner for vintage holiday charm. But this week, beginning Thursday, November 1, it's four nights of Casablanca, the 1942 romantic classic that stars Humphrey Bogart and Ingrid Bergman as star-crossed lovers who must balance their love affair against the needs of a war-torn world. Are the problems of three little people worth a hill of beans in this crazy world? Will Rick and Ilsa always have Paris? When film critics are asked for the best films ever, they usually come up with choices like Orson Welles' Citizen Kane and Alfred Hitchcock's Vertigo. But when regular folks are asked to pick their faves, Casablanca is always a contender. Even over at IMDB, where I tend to think the ratings are driven by the taste of teenage boys, Casablanca is tied at No. 23 on their Top 250 list, the only film made before 1950 to make the Top 30. And, yes, that puts it higher than either Citizen Kane or Vertigo, as well as It's a Wonderful Life, The Wizard of Oz, City Lights, Rashomon, All About Eve, The Maltese Falcon, Mr. Smith Goes to Washington and It Happened One Night. 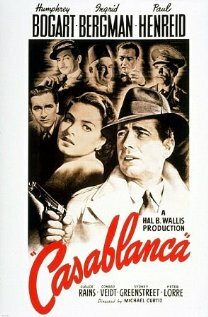 Casablanca was supposedly a happy accident in its time, with the perfect combination of luminous Ingrid Bergman, Humphrey Bogart at his wounded, world-weary best, a patched-together screenplay penned by Julius and Philip Epstein along with Howard Koch, and skillful direction by Michael Curtiz. Warner Brothers was known for this kind of moody, suspenseful, done-on-the-cheap picture featuring conflicted characters, but this time, with Bogart and Bergman in roles that fit their on-screen personae like a glove, cast against a backdrop of spies, danger, Nazis and the higher purpose of keeping the world safe, with a supporting cast that's about as fine as any assembled, well, Casablanca works like a charm. Some of the joys in the movie include Peter Lorre, Sidney Greenstreet, Paul Henreid, S. Z. "Cuddles" Sakall, Conrad Veidt, and Dooley Wilson singing "As Time Goes By." And, of course, Claude Rains as Captain Renault, half of the "beautiful friendship" that gives the film its famous last line. I may be more into romantic comedy than drama like Casablanca, but that doesn't mean I don't feel it in my heart when the music swells and Rick says, "I thought I told you never to play that song." Oh, Rick. Poor bruised, heartbroken Rick. Or when they end up at the airport, and they're wearing those perfect clothes and perfect hats in that perfect close-up, with the perfect amount of smoke and fog, it really does feel like the whole world is riding on their decision. "Here's looking at you, kid."